What Cattle Eat Today Can Stop Tomorrow’s Horn Flies! 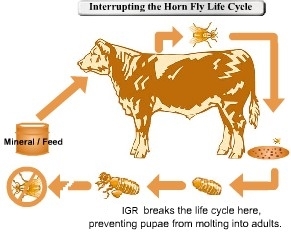 IGR is an insect growth regulator that passes through the animal into the manure, where horn flies lay their eggs. It breaks the life cycle by preventing horn fly pupae from developing into biting adult flies. Postive Feed Products containing IGR eliminates the expenses, labor and stress on your cattle associated with sprays, dusts, ear tags and pour on products. There’s no need to handle cattle because the animals spread the horn fly control as they graze. The horn fly is one of the most important and economically damaging pest of range cattle. In the United States they cost cattle producers approximately $876 million every year. Begin feeding PF tubs with IGR before the flies appear. PF tubs with IGR’s unique ingredient, Methoprene, even controls horn flies resistant to the organophosphates and pyrethroids commonly used in conventional horn fly control products. Scientists estimate that an economical, effective program keeps the fly population below 200 flies per animal. Adult flies migrate from other herds. PF IGR feed thru does not kill adult flies. PF tubs with IGR prevents the flies from multiplying, hence, breaking the flies life cycle. If feeding free choice feeds, put out a 30 day supply. Place the tubs near watering holes or loafing areas. Check consumption for a few days. Increase or decrease number of tubs, or move them if necessary, to adjust for proper consumption. Postive Feed has produced several products containing IGR. Click on the buttons below to learn more about each product. 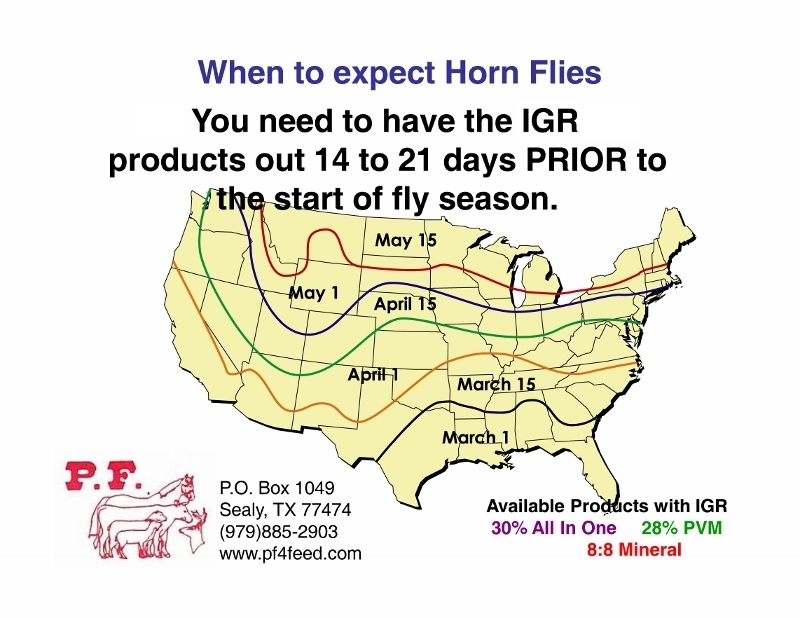 The most convenient way to control horn flies in beef and dairy cattle is to supplement with PF tubs containing IGR feed-thru. Insect growth regulator passes through the animal and into the manure, where horn flies lay their eggs. It breaks the life cycle by preventing horn fly pupae from developing into biting adult flies. PF tubs with IGR products eliminates the expense, labor and stress on your cattle associated with sprays, dusts, ear tags and spray on products. There’s no need to round up or handle cattle because the animals spread the horn fly control as they graze. Building a season-long control program around P.F. IGR products. Left untreated, a few horn flies can quickly explode to populations of 1,000 to 4,000 flies or more per animal. Scientists estimate that an economical, effective program keeps the fly population below 200 flies per animal. Occasionally, adult flies migrate from other herds. Feed-through like IGR do not kill adult flies. However, IGR prevents the flies from successfully multiplying, breaking the life cycle. Horn flies emerge in the spring when average daily temperatures reach 65 degrees for a period of two weeks. In most years, PF tubs with IGR alone provides excellent season-long control, when used as directed. If fly populations exceed acceptable levels (likely due to migration from untreated neighboring herds), use an approved adulticide to knock back the fly population. An effective program keeps fly levels to less than 200 per animal. Use this handy guide to help evaluate the fly population on your cattle. It’s easiest to check flies in the early morning, when they are usually on the upper side of the animals. The right choice for cattle, the environment and you. PF IGR is unique in that it is an insect growth regulator, not a conventional insecticide. Consequently, it is the right choice for your cattle, the environment and you. Used as directed, IGR is not harmful to birds, fish, reptiles, mammals or beneficial insects. In addition, there is wide-spread horn fly resistance to organophosphates and pyrethroids. You can feed IGR to lactating dairy cows. There are no withdrawal times required for either beef or dairy animals. 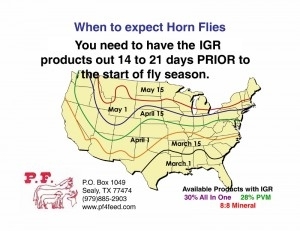 Choose the horn fly control product that’s effective, convenient, and economical (as little as .03 to .05 per head per day). This year, feed PF tubs containing IGR to your herd.